These are two janitors as Danny Boyle’s “A Life Less Ordinary” opens as they involuntarily hear out the pitch of their fellow custodial technician, hapless Robert Lewis (Ewan McGregor), for his Great American Trash Novel, something to do with the secret daughter of John F. Kennedy and Marilyn Monroe and a stash of Nazi gold. The dude on the right, leaning forward with bugged out eyes, is strictly faux-enthusiasm, pretending to hang on every word, while the dude on the left is too exhausted to feign enthusiasm, receiving Robert’s spiel with the air of a non-college football fan forced to listen to a college football fan espouse about the hokey majesty of certain defunct bowl games. Somewhere in-between the reaction of these two men is the reaction of Reverend Toller (Ethan Hawke) in Paul Schrader’s recently released “First Reformed” (which we will delve into more deeply next week) when he is made to negotiate a moment in which the Pastor of his parent church, Joel Jeffers (Cedric the Entertainer — nay, Cedric Kyles) makes a PG-13-ish joke about A Mighty Fortress is our God. At first, Hawke has his Protestant Reverand emit a pained smile, not a laugh, one obligated to engage with his superior’s nominal joke-making but clearly struggling to. After Jeffers keeps hammering away at the weakly brewed punchline, Toller’s defiance finally gives way as Hawke lets loose with a vociferous “Ha!”, like he has been trying to summon the wherewithal the entire conversation to give the guffaw he knew he was supposed to muster in the first place, and had to try so hard to make it happen that now he has gone over the top. 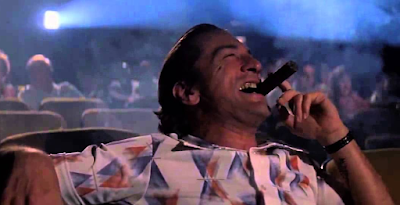 Toller’s laugh suggests a willingness, however arduous, to continue engagement with polite society’s rules; Max Cady’s movie theater laughter, cutting through his cigar smoke, in “Cape Fear”, on the other hand, has ceased all engagement. There is something noble in putting on a brave face, after all, though there is also a thin line between putting on a brave face and surrendering your soul by way of surrendering your sanity. And while Max Cady is a wickedly immoral character whose murderous impulses bear no comparison to mere social manners, there is still, simply in the space of that movie theater laughter, an evocation of a man who has likely been put through the same social ringer as Reverend Toller one too many times. And rather than stick to the norms, he has willfully gone crazy. 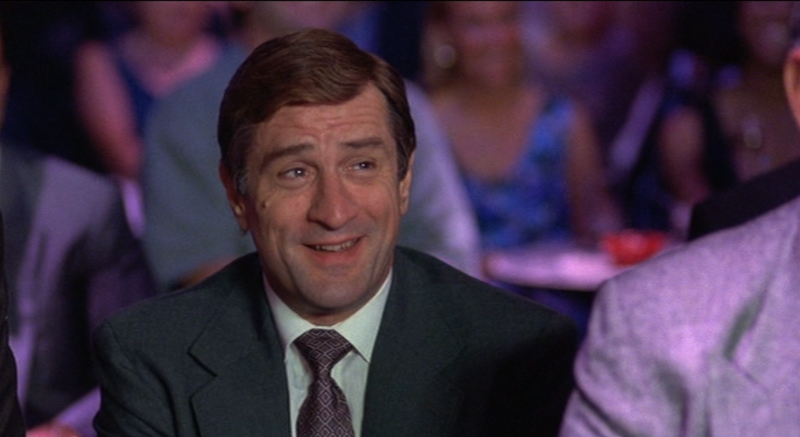 If there is truth in laughter, and there is, it is found in John McNaughton’s underrated 1992 opus “Mad Dog and Glory.” That’s another DeNiro movie, and there he plays meekly-mannered cop Wayne Dobie – nickname: Mad Dog – who kinda, sorta inadvertently falls in with a Mafioso named Frank Milo (Bill Murray), getting invited to Milo’s club where the mob boss can force his standup comedy on the crowd since, hey, as he says, he owns the place. Wayne is forced to endure Milo’s set amidst the crime boss’s lackeys, all of whom roar with laughter at everything their dear leader says, whether it’s funny or not, not unlike Reverend Toller, just a little less Protestant, a little more pasta-sauced Catholic. Wayne, however, can’t fake it. But then a funny thing happens – that is, Milo tells a joke that makes Wayne laugh. 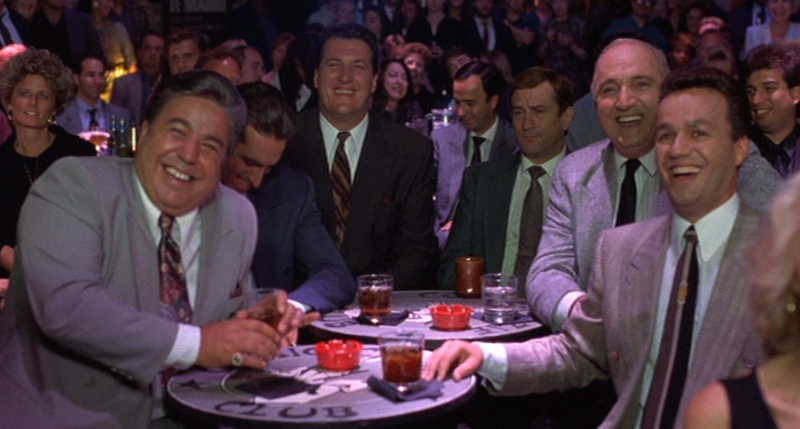 He can’t hold it in, even if he might want to, which is the best kind of laugh, the sort that emerges instinctively. It feels good to laugh, for real, especially in times when it seems like the last thing you would ever want to do.